Car/truck/bike show, 1/4 mile drag racing, stereo crank it up contest, burnout contest (time permitting), vendors, pit midway, DJ, 2 step competition, low car limbo. 9/23/18. Car show registration from 9am to 12pm (absolute latest 3pm), judging begins at 10, awards ceremony around 5. Drag race roll-in starts at 8:30am, heads up drag race qualifying (2 rounds) start at 11, drag race eliminations around 2. Event ends around 6pm. Car/truck/bike show, 1/4 mile drag racing, Usaci single points stereo crank it up contest, burnout contest (time permitting), low car limbo, 2 step/rev competition, vendors, pit midway, DJ. All spectator tickets and competitor registration forms can be bought on the day of the show at the front gate. Purchase your tickets in advance and $ave. *Online ticket sales end the Friday before the event at 4pm CST. - Car Show Entry $35 at gate $25 online with code (does not include free passenger pass). 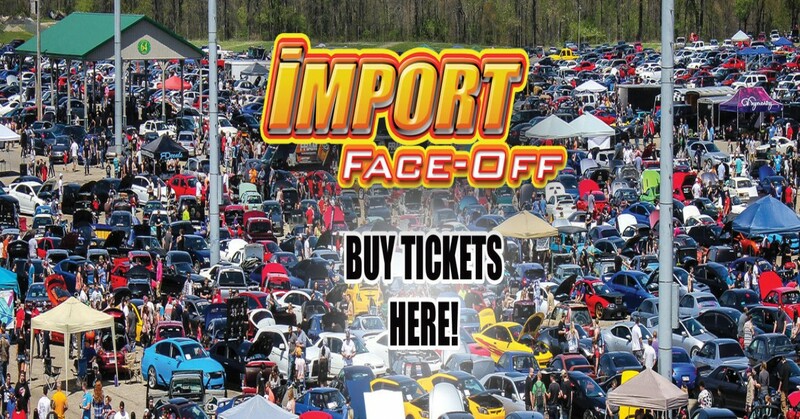 For event status info when the weather looks questionable, call the IFO phone line at 225-247-RACE (7223) or visit this link: http://forums.thefoat.com/ImportFaceOff/sg-forums.thread/th-502 check for updates the Saturday and Sunday morning before an event). If an event is completely canceled after gates have opened, spectators can use their arm band for discounted or free entry (depending on what time of the day event is canceled) into any future IFO. If event is canceled before eliminations begin, racers will receive free race admission into any future IFO. If a race is canceled after the first round of eliminations, payouts are split evenly with those left in the competition. Trophies for each class will go to the fastest racer of the last round. Once gates have opened, there are no refunds. This is standard policy for all outdoor events (motorsports or baseball) not just IFO. Do not come to an IFO event if you do not agree with this policy. If gates never open, complete refunds will be issued within 48 hours to all who purchased on-line tickets in advance.